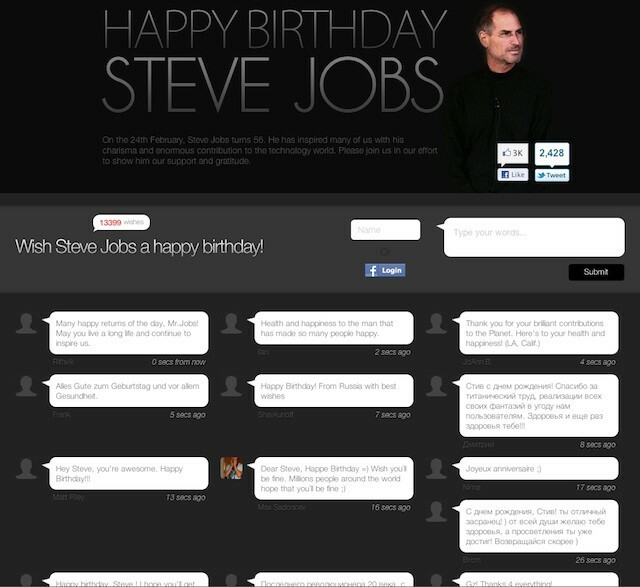 The HappyBirthdaySteveJobs.com tribute website is going gangbusters. Thrown up a couple of days ago, the site has survived attacks from malicious hackers and has seen more than 45,000 visitors from 147 countries. It is currently displaying more than 13,000 birthday wishes to Steve Jobs, whose birthday is today. The website was attacked by some random isolated people. I think when you have a website that becomes very quickly popular and is a place for people to express themselves freely you’ll always have a couple of trolls. However, it is amazing to see that really all the messages are sincere and supportive! …. We’ve been up all day and night to make sure everything runs smoothly! We are seriously sleep deprived… but it is really exciting to be part of this. There are some really great and amazing wishes from people. We intend to close the post of wishes tomorrow 9-10am London time, and in the next couple of days we will prepare a special page for Steve Jobs.